At the moment I'm doing a lot of chat about campaign planning. Working in a big, research-led university this means speaking to academics, to senior administrators, to colleagues and to the university leadership. We're talking about what makes a successful fundraising project. A fundraising campaign is not just about raising funds. Okay so you do have to raise funds, that goes without saying. And to do that you need a good project, prospects, buy in... yadayada, we'll talk about that some other time. But it can add oh so much more value to your organisation than just money. It's about getting a sense of who you are and where you're going. It's about building capacity. It's about creating a moment in time where you can deliver a step change. It's about raising your eyes to the stars and saying, WE CAN and about saying it with one voice. Please don't imagine where the bullet points are concerned that last equals least. Not a bit of it. Let's take that phrase "increased reach across the board." What the devil does that mean? Well how about this. When creating your case for support you work out what your organisation is all about. If you work for (for example) a large research-led university, you might be working that out at a micro level. You might be dealing with a specific College, or School, or Department. The principles are exactly the same. Let's say you know your USPs. 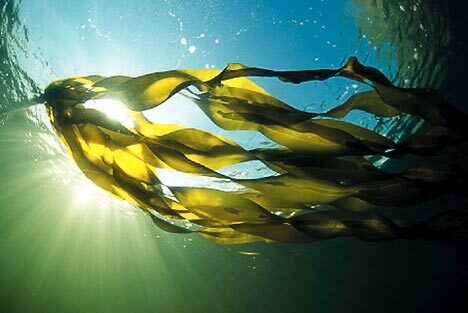 Let's say you know that you are world-leading in fish genetics and the circadian rhythms of seaweed. Let's say that part of your organisation's vision is to create a unique, state of the art underwater laboratory to study your fish and your seaweed and to understand their interaction. Let's say philanthropy alone won't deliver this project. That doesn't matter. Because you and your organisation have a strategic vision that will. The people that donate to your project aren't just donors, they are stakeholders. They are influencers and advocates on your behalf. They are partners in delivering this project. The academics who have been your champions for the project, who have met with donors and discussed their work are more than colleagues. They're signed up. They're on message. They're singing from the same hymn sheet. In fact, they are stakeholders too. You've been busy within your organisation. You've been engaging senior people, sharing success and letting everyone feel that they are a part of this project and an important part. You've been banging that drum so damn loudly you can hear it all the way to Timbuktu. Everyone is talking about the brave new world of pisci-tech. It's a buzz word, flavour of the month. They're not just talking about it internally, they're talking about it externally. That last gift - it made the news. Your corporate donor did a press release on why they invested. You are becoming known as the place for pisci-tech. Your funding relationships are strong and well nurtured, which is good because now they're going to help you yet further. Thanks to the huge endorsement of your private funders, public funders are expressing an interest. Your academics get the chance to talk to research councils and development agencies about their work. Who knew that fish could be so cute? Next thing you know a call for funding has been put out by the research councils for funding pisci-tech. But you knew that, because you shaped that funding call. Thanks to your beautifully nurtured private funders you had corporate partners signed up to help you to make the case that the research councils should put out a call. Five years on and you're standing in front of a gleaming marine laboratory filled with waving fronds of seaweed and darting fluorescent fish. It's the world's most glorious fish tank. It is an international hub for pisci-tech, no the international hub for pisci-tech. Damn it, it was the place where pisci-tech was born. Ok so this is in Berlin, but you get the idea. Behind you is a shimmering glass donor board featuring the names of 342 supporters. It includes companies, people, research councils, charitable trusts. Private funders. Public funders. A student wanders past you wearing a t-shirt with a fish on it. It reads University of St Aloysius, transforming the ocean fin by fin. The student is from Singapore. International recruitment is up by 30% thanks to a sustained campaign involving alumni in the department's work. "Goodbye corporate funder, come back soon!" In the doorway, you see an academic waving farewell to a corporate funder who has become a research collaborator, one of many to do so. There is an innovation team behind that door, working on maintaining and building on those corporate relationships, a key plank of the university's knowledge transfer activity. The new facilities have meant that it is has been possible to attract outstanding new academics. Two new chairs were appointed last year, including the world's first Chair in Pisci-technology. You've had nothing to do with student recruitment. You've had nothing to do with innovation. You've had nothing to do with funding or appointing the new Chair. These things have been born from the vision which drove the campaign. They've emerged from the strong and vibrant community of stakeholders which developed around the project. They've come as a consequence of a more collegiate atmosphere, of an increased ambition, of a willingness to engage with each other and the outside world and a sense of shared purpose. So it's worth doing right, right? Six months into my new development role in a School and coming from a team of 35 to just me and a part-time assistant, I’ve learned a few lessons along the way. Lesson number one - educate the teachers. One way is to write a plan, not a huge wordy treatise, but something which simply explains how you are going to identify prospects, cultivate relationships and ask for money. When people understand the fundraising process and trust you as a professional, you will buy time to get on with it and their help when you need it. One Deputy Head remarked; “I never knew what fundraisers really did until I read your plan”. Lesson number two – focus on fundraising. In a small team when you are expected to do everything from updating the website to organising reunions, from processing annual gifts to event fundraising…it is easy to lose sight of the big goal. Stay focussed on advancing your major gift prospects (if that is part of your job) as this will ultimately prove your worth to the organisation which pays your salary. When you are successful, then you can make the case for a bigger team. If asked why you can’t do it all (why can’t we run a Telethon in-house now?) 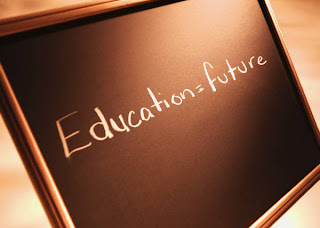 – refer your Headmaster/mistress and the Governors back to the Plan which after all, they approved. Lesson number three - get to know your teachers and pupils. Teachers know the pupils, their parents and school life much better than you do. They will alert you to prospective donors, help with visits and inform your Case for Support. If you know some pupils and what they think of the school, it provides you with some fantastic stories to really make your case. Ask if you can shadow a pupil for a morning – it’s a real eye opener into how sassy, funny and smart teenagers are. Lesson number five – take a risk. As the development professional who is supposed to know everything about fundraising (when you might only have focussed on one area in a big team and had big backup), you can stick to what you know works. Get out of your comfort zone (for me it is legacies) and learn new skills. That is the beauty of working in a school, if you have the Head’s backing, you get to shape the programme and make decisions a lot quicker than in a bigger organisation. Yes, sometimes you will get it wrong, but it all adds to your experience and no-one said school was easy…. Jo is a fundraiser who has worked across all areas in large and small teams. Most all she loves meeting people, hearing their stories and bringing them together with a great cause. She also enjoys analysing results and pinpointing what works (and what doesn’t). She writes here about the transition from a big fundraising team with many specialists to a one woman band responsible for everything with its inevitable highs and lows. If there is anything I have learned over the past three weeks, it is that tiny babies don't come with a set of guidelines. Sure, there are many - MANY - how-to's out there, from ultra-regimented Gina Ford to the very cuddly Baby Whisperer. But guess what - turns out that every baby is unique and what works for one baby makes the next one scream bloody murder. How amazing would it be if, along with the baby and the goo, a neat little pocked-sized manual would pop out, complete with optimal feeding times, specific rocking frequencies for falling asleep and a rational explanation for just exactly why a small baby thinks of nappy changing as the worst thing in the world. How much easier would life be. Which is why I still cannot believe that I once received the following question from a potential applicant to a grant scheme: "Is there any point in reading the guidelines?" Excuse me?! It is true that over the last few years, the nature of trust fundraising has changed somewhat. Rather than the old 'us' and 'them' stand-off between funder and fundraiser, the focus is increasingly on working in partnership. However, this does not mean that the fundraiser can solely rely on his or her personal relationship with Trustees in order for a bid to be successful. And of course, there are many instances where it is much more difficult to form such a relationship anyway, for example when you are approaching research councils for funding. One thing that is important to understand about funding guidelines is that they exist not only for the benefit of the applicant, but (primarily?) for the benefit of the funder. Funders have a limited amount of both time and money available, and they do not want to waste their time over applications that do not fit with their priorities, are not specific or are badly put together. This is why funding guidelines usually fall into one of two categories. 1. Content: is the project a fit for the funder? Funders often have a clear set of priorities for awarding funding, which can be fairly flexible or incredibly specific. Guidelines can therefore be invaluable for working out whether this particular grant scheme fits with your proposal as it stands, whether you can tailor your proposal to improve the fit, or whether putting in a detailed application will be a waste of both your and the funder's time. Just like you should tailor your CV to every job you apply for, so you should rewrite your funding proposal - as drastically as necessary - for every funder. Submitting the same application to different funders is a no-go and will almost certainly get you nowhere. 2. Style: can the applicant produce a well-written, properly laid-out proposal? Sometimes, style guidelines can feel a bit like jumping through arbitrary hoops. However, they do create a level playing field and there is really no excuse for not following stylistic guidance to the letter (or point size). A shoddily produced funding application is just as damaging as submitting a badly formatted CV, forgetting to include a covering letter or turning up for a job interview in shorts and flip flops: it appears to show that you are not taking the funders seriously. Paying due attention to the layout - from a properly designed front cover for a hard copy document to inserting paragraph breaks at regular intervals in an online form - will really make your application stand out. I am a great fan of good guidelines, because they make the fundraiser's job a lot easier. Sometimes, though, you have very little to go on and will need to rely on previous experience and your gut instinct. As for me and my three week old, we will eventually figure each other out - I am just grateful there is no deadline. 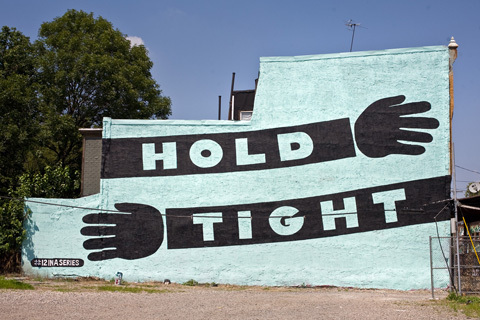 Last week we talked about holding on. Holding on to our precious resources – our donors. Donors who do not renew their support represent wasted resource, wasted opportunity and lost income. So how can we renew and retain donors? Have you ever tried to cancel your phone contract? I have. Who do you get put through to if you try to cancel? The retention department. You see, phone companies know the value of me as a customer. They know that is worth their effort to have an entire department dedicated to making me stay. Even at a reduced rate, or with a new handset, it is cheaper to keep me as customer than to recruit a brand new one. As charities we need to realise the same. It is a better use of resource to try and retain donors than to recruit a new one. Of course recruitment has an important place – but if all your donors are ‘one gift wonders’ this cannot represent a good return on investment now can it? As fundraisers we should all be in the Retention Department for our charity. We can’t offer the new iPhone to our supporters or free 3G, so what can we do? Here are 5 areas to look at, that could have a positive impact on those retention rates. 1 How do you ‘treat’ your lapsed donors? We talked last time in ‘Holding on’ about lapsing being an entirely internal term. Your renewal appeals should treat these people as supporters – not as new recruits. It should reference their support and the relationship they already have with you. Negating to mention this will smack of ingratitude. Ingratitude does not a loyal donor create. 2 Are you thanking your donors appropriately? I wrote in my post ‘Do your donors read the annual review’ about the stewardship communications we are sending. Are they hitting the spot? Do you donors feel they are being thanked appropriately? They should show your supporters what their gift has enabled, why you value them as a supporter and what their support could make possible in the future. Your communications should talk about the donor and their gift not the organisation and your mission. 3 Is every point of contact between your organisation and the charity a positive one? We talked last week about ensuring that every member of your organisation understands the value of your donors. Is every point of contact between you and the donor a positive and memorable one? In practice this means regularly updating your website, responding quickly and effectively to donor’s requests for information, thanking them promptly for their gifts, and giving them opportunities to get involved in your work beyond making a donation. 4 Are you fulfilling your side of the bargain? If you asked for a gift for x – do you tell them about x in your follow up, or about y instead? If you break a promise, and do not follow through on your promise – to use the money as you have said you will – then the donor is unlikely to become a loyal patron. 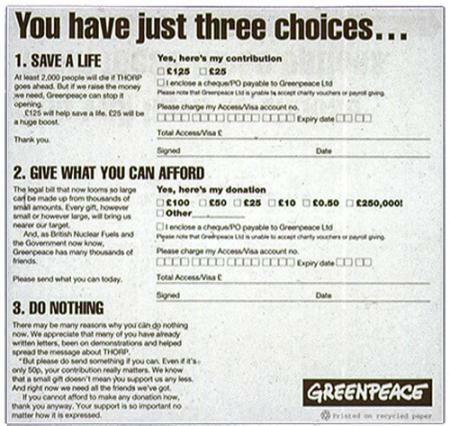 There is a great example from Greenpeace where they could not fulfil their side of the bargain. In the 1990s the firm British Nuclear Fuels, which then ran several nuclear power and processing facilities for the UK government, took legal action against Greenpeace, who had been doing everything that they could to frustrate the opening of a new nuclear waste reprocessing facility at Thorp in the north of England. Though supported by public opinion, Greenpeace’s lawyers advised the campaigners that the case was unlikely to go anything other than BNFL’s way. So Greenpeace turned to their supporters and appealed for funds to meet the costs of a court case they believed they were doomed to lose. The anticipated sum that they thought they’d have to fork out to cover legal costs was £250,000. Greenpeace donors responded generously, giving substantially more to the fighting fund than Greenpeace expected they’d be obliged by the Court to pay. Greenpeace lost the case on a point of law, but the judge felt that they had the moral high ground so he awarded costs to the other side of just one penny. Having raised a lot of money that wasn’t needed for the purpose, Greenpeace realised they had not fulfilled their side of the bargain with all these donors. So they did the only honourable thing and offered donors their money back. Only six took up the offer. All of the rest of the supporters saw this honest gesture, and let Greenpeace keep the money for their other work. By offering them back their donation when they couldn’t fulfil their side of the deal – they earned the trust, and no doubt future support, of these donors. 5. Are you investing in renewing? What is your budget allocation for renewal mailings? If your donors receive all singing all dancing recruitment packs and then the post-gift experience is an afterthought, it’s no wonder they don’t renew. This isn’t even necessarily about spending money. A simple letter with a strong case and personal message can work fantastically well. But it must be well considered and planned into the wider strategy– not a last minute piece thrown together when numbers are down. So that’s all for this week. I’m constantly thinking how my organisation can improve retention - because even a percentage point improvement means a sizeable chunk of income. Just a small subject then. Actually, I phrased that badly. This post isn't about important stuff every organisation should think about, it's about important questions every organisation should ask itself. Regularly. The first is this: what's happening all around you? The second is this: what's coming next? I've been lucky enough to work in an organisation which was in the habit of questioning itself, monitoring its success - and failure, horizon scanning and innovating. It had a big vision for itself and big ambitions, but it brought them back to what was achievable in the next year, the next six months. Everyone had a role to play. Everyone understood that role. That was a voluntary sector organisation and one which did not accept government funding. Its financial planning needed to be robust and it needed to be accurate. It needed to have a mix of income streams to ensure its financial stability. I've talked before about why fundraising is important. But let's not stop there. What if fundraising disappears? What if - for example - you're reliant on direct marketing and postage cost go up (whoops, they just have)? 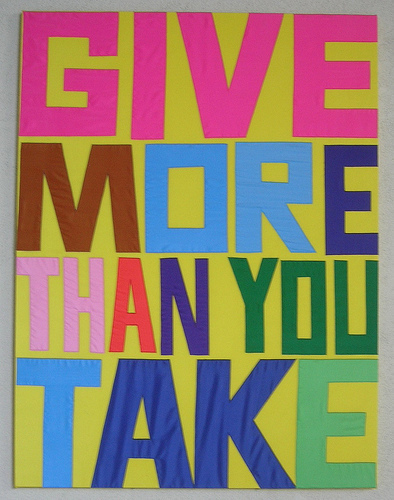 What if you're reliant on major gifts and gift aid disappears (check out the Give it Back George campaign)? Let's say you're a department in a university with a great track record in research. Let's say you've benefited from sizeable research council grants and capital funding. Let's say there's an economic crisis. Word to the wise - funders help those who help themselves. If you show initiative, if you build private partnerships and pool resources your chance of winning that scarce public funding shoots up exponentially. Philanthropy may seem a tiny little bean in comparison to a huge research council grant, but from that private funding you can climb the beanstalk to find that golden goose. No bean, no stalk, no goose. Let's say you're a charity acquiring most of its supporters from on street fundraising (chuggers). Let's say the streets are suddenly full of chuggers. Let's say that your competitors chuggers are doing better than yours. What do you do? Wait until you're in financial crisis to innovate and the chances of succeeding are minimal. Would you give your money to a charity which might fold in six months? Or would you rather give it to a charity which will grow, invest and continue its work? You'll get desperate and you'll do silly things. You'll throw all your money at a major gifts fundraiser in the hope they will wave the magic fairy wand of wealth and half a million will drop from the sky in six months. Maybe that will happen. And maybe you will win the lottery. Major gifts will take a couple of years to become truly profitable. So don't wait until you're desperate. Ask yourself these questions now and ask them again in 6 months time, in a year, 6 months after that. Ask yourself whether you're losing or gaining market share. Ask yourself if you're in a position to diversify and innovate, with the understanding it might take months if not years for your investment to pay off. Ask yourself "what's on the horizon?" What's coming in from left field? What's right under your nose? Changes in government funding? A squeeze on the private sector? A growing trend towards social entrepreneurism or venture philanthropy? Don't bury your head in the sand. Be a good friend to your organisation. 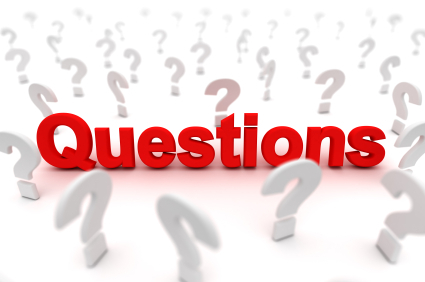 Ask questions now, not before its too late. Fundraising isn't just Fundraising. Fact. Today’s post is entirely focused on holding on. To what, you might ask. To your most precious resource, of course. Your lovely donors. Do you know how many of your donors ‘lapsed’ last year? As a quick but crucial aside – please don’t ever refer to them as lapsed. I have seen mailings say the words ‘as a lapsed donor…’ Stop this already. This is a dreadful internal charity term. Your donors do not think of themselves as ‘lapsed.’ Think of all the charities you would call yourself a ‘supporter’ of. Have you made a gift to all of them in the last 6 or 12 months? My guess is that the answer is no. Your donors think they are supporters too. Just not recent ones. Bringing in new supporters is crucial. I’m afraid that you’ll never hold on to every donor each year, so brand new ones are the only way to grow the donor base. But what does your organisation invest in donor acquisition? My bet is that this figure is a fair whack. But if we are acquiring donors we are not 'holding onto', this is a poor use of resource. Once you have wowed a donor into supporting your cause – what happens next? Is the post–gift experience as engaging and exciting as the recruitment? Perhaps not. Take a look at who ‘lapsed’ last year? If they’d made the same gift as in the previous year, what would the value have been to your organisation? Make sure everyone in your organisation knows this figure. Every interaction, email, conversation and piece of mail sent to a donor should occur within the context that your donors are your most precious resource. Imagine if you could just improve your retention figures by 5% - what would that mean to your income? Before you send yet another acquisition piece, take a look at what’s going out to your donors. Niamh took a whistle stop tour of retaining donors here. Next week I’ll be back with some actionable ideas for holding onto donors. A few weeks ago I wrote a blog on stewardship – which was a whistle stop tour on how we thank our donors. As fundraisers we can sometimes get into the mindset that we just take money. This puts us at a complete disadvantage and a weak position when it comes to our relationship with our donors. We should look at ourselves as givers and shake off the negative. So what can we offer? What do we have, to give to our donors? All of these will make you at ease with your donors and they will begin to thank you for the relationship. In previous posts I described how data analysis can help with planning and measuring performance. Analytics can also be used to direct activity. This could mean anything from mailing segmentation to predictive modelling or even managing a prospect pipeline. How do you engage your prospects? How do your prospects respond? At a general level there are three ways to solicit your prospects; by mail, by phone or through face to face contact. Paying attention to how these methods interact in your business can draw some interesting results. Looking at large appeal mailings and telephone campaigns over a 5 year period I wanted to know who we have reached and what the cross-over between these methods has been. Unsurprisingly, the figures showed me that, excluding a few unusual cases, we have been mailing and calling the same people. Within the sample we may have contacted each constituent multiple times using both methods. Mailing is much less expensive so it is again unsurprising that the percentage of those mailed is much larger. 83% of those in the sample had only ever been solicited by mail and had never received a phone call. The cross-over represents a little over 16% of the total. I was interested to know how the donations we received from these methods stacked up in comparison. 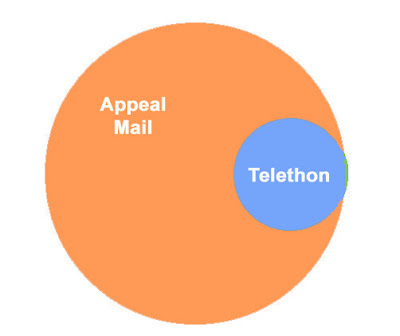 Would it be the case that our telethon donors would sit as a subset of or direct mail donors? The results did not support this. The split is very different. What I found was that only 4% of the sample cohort had donated by both post and phone. Also, despite only reaching 16% of the sample, 59% of the donations arrived via the telephone. I also compared the result with those that have also donated thanks to a face to face meeting with a fundraiser. Telethons are a successful way of recruiting donors. 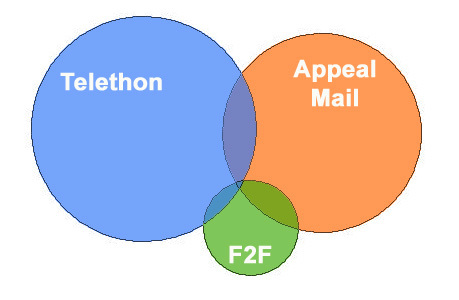 There is very little cross-over in donors between direct mail and telethon. There are of course many reasons why this may be the case but the suggestion is that prospects have a preferred method of contact. This insight can be fed into my next modelling project. It reminds me of how specific I need to be when deciding what behaviour I aim to predict. Those that have given by both methods are a small and interesting bunch that need closer inspection. There is very little cross-over between those that donate over the phone or by post and those that give by face to face solicitations. Does this mean that our major gift fundraisers are not feeding their prospect pools from our existing donor pool? I can use this evidence to look at the way our pipeline for major gift is populated. The ultimate aim is to solicit each prospect in the way that suits them best. Don't assume that because someone made a gift in a direct mail appeal that it makes them a good candidate for the telethon. Examine the evidence.